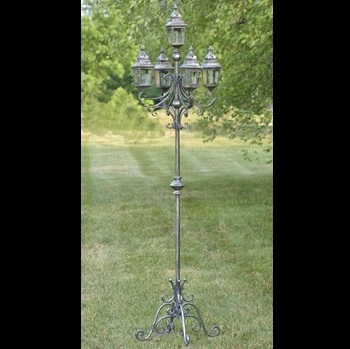 This "Paris 1968" Standing French Lantern stands over 7 feet tall and are absolutely stunning! Would you believe that these are more sought after for Prom themes than even weddings? Corporate Fundraisers and Galas also utilize this piece in their elegant themes to usher in beautiful ambience at the entrance, on the stage, and for cocktail hour by the bar. These do not have an electrical cord, but take battery operated lighting so no worries about tripping. PLEASE NOTE!! We have two Silver and one Gold Lantern in our inventory for rentals only. Due to sky rocking tariffs, we will no longer be able to sell them. Rentals are always available.